Precipitate hardening is commonly used in materials science to control strength by acting on the number density, size distribution, and shape of solute precipitates in the hardened matrix. The Fe-Cu system has attracted much attention over the last several decades due to its technological importance as a model alloy for Cu steels. In spite of these efforts several aspects of its phase diagram remain unexplained. 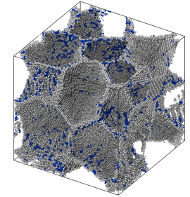 Here we use atomistic simulations to characterize the polymorphic phase diagram of Cu precipitates in body-centered cubic (BCC) Fe and establish a consistent link between their thermodynamic and mechanical properties in terms of thermal stability, shape, and strength. The size at which Cu precipitates transform from BCC to a close-packed 9R structure is found to be strongly temperature dependent, ranging from approximately 4 nm in diameter (~2700 atoms) at 200 K to about 8 nm (~22 800 atoms) at 700 K. These numbers are in very good agreement with the interpretation of experimental data given Monzen et al. [Philos. Mag. A 80, 711 (2000)]. 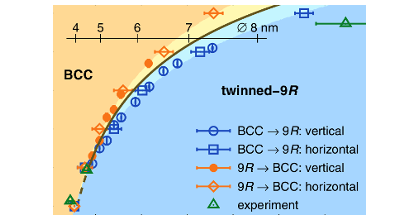 The strong temperature dependence originates from the entropic stabilization of BCC Cu, which is mechanically unstable as a bulk phase. While at high temperatures the transition exhibits first-order characteristics, the hysteresis, and thus the nucleation barrier, vanish at temperatures below approximately 300 K. This behavior is explained in terms of the mutual cancellation of the energy differences between core and shell (wetting layer) regions of BCC and 9R nanoprecipitates, respectively. 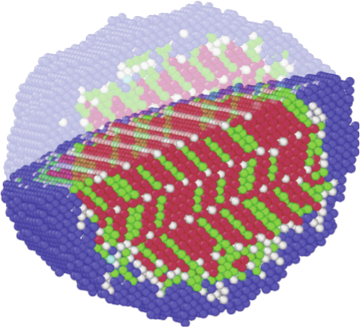 The proposed mechanism is not specific for the Fe-Cu system but could generally be observed in immiscible systems, whenever the minority component is unstable in the lattice structure of the host matrix. Finally, we also study the interaction of precipitates with screw dislocations as a function of both structure and orientation. The results provide a coherent picture of precipitate strength that unifies previous calculations and experimental observations.